I’m a guest on author Sorchia DuBois’s blog today, and the post is all about the paranormal…specifically, activity at The Witch House, the 17th-century landmark where I work. If you didn’t catch my October post about the goings-on there, you’ll want to check it out here! 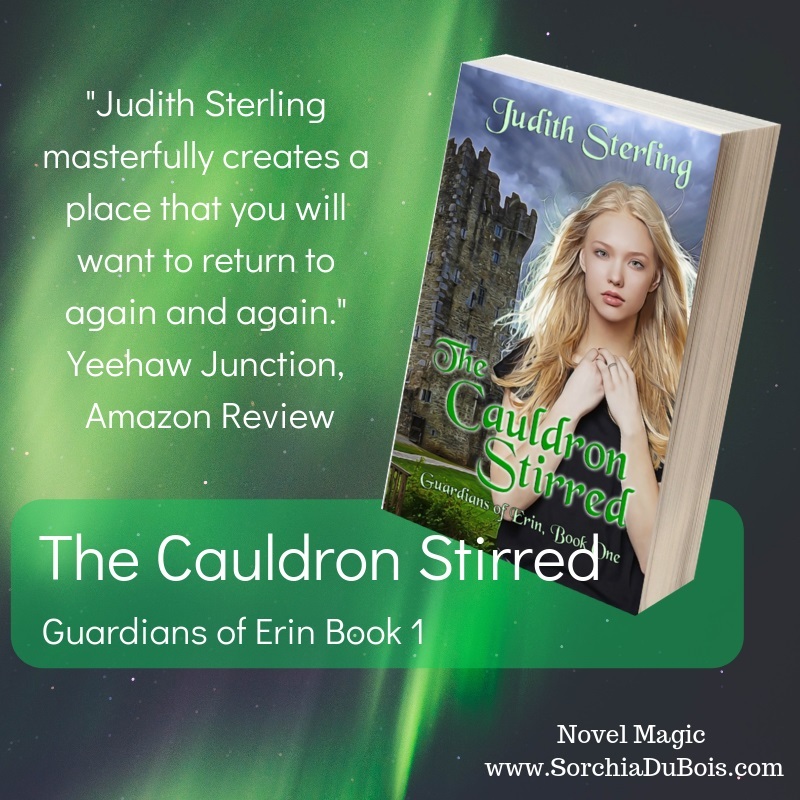 We’re also giving away five e-copies of The Cauldron Stirred in anticipation of the release of The Stone Awakened (Book 2 in the series). You can enter the giveaway through midnight on December 21, the perfect date because the winter solstice plays an important role in the second book! The winners will be announced later that day on a follow-up post, which will feature an excerpt from The Stone Awakened. Enter the giveaway here! Happy Halloween! I worked all day at The Witch House (a stylized picture of which is pictured above). Now my husband and I are getting ready to take our kids trick-or-treating. Things are hopping here in Salem! When we get home, we’ll settle down in front of the TV to watch the live Ghost Adventures event hosted by Josh Gates on The Travel Channel. Should be a fun night! If you read my recent post about the paranormal activity at The Witch House, here’s a quick update. One of the bed warmers circled again yesterday. Then today, the bed warmer in the other bedroom started circling. I wonder what Margaret–and any other spirits who are hanging around–think of all the tourists who’ve filtered through The House during the past month. We’ve been super busy! Of course, I figured out who was contacting me via the bed warmers after the interview occurred. Well, it’s time to trick-or-treat. 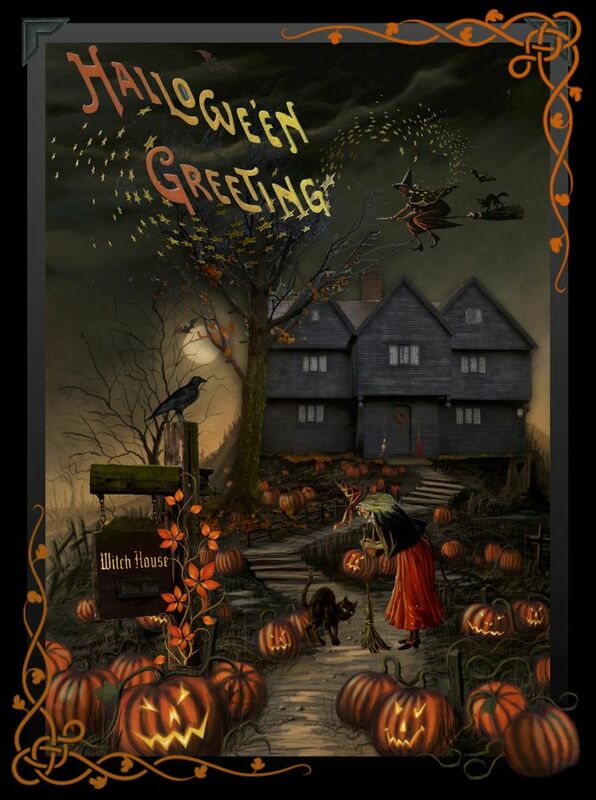 Wishing you a fun and safe Halloween night! Every October in Salem, Massachusetts is interesting, but this one stands out, especially where I work: The Witch House, the home of 17th-century witch trials judge Jonathan Corwin. My connection with the place started years ago. When I was ten years old, living in central Florida, the Salem Witch Trials of 1692 fascinated me. 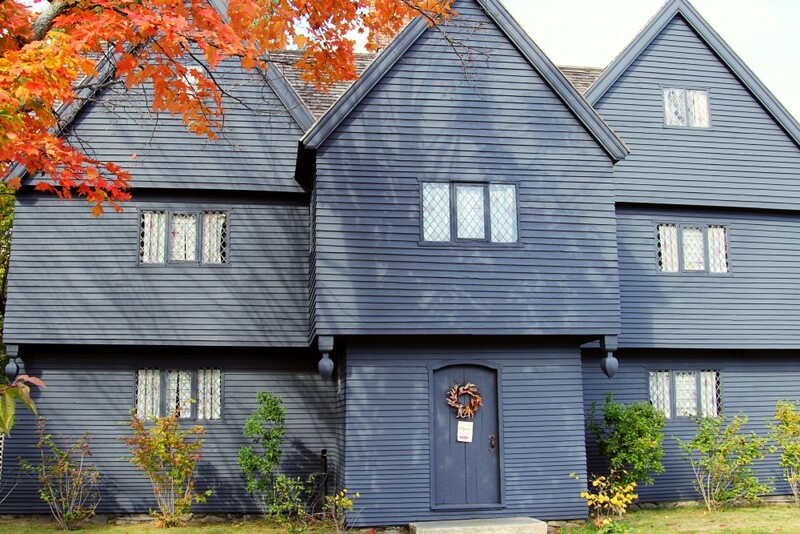 I vowed to go to Salem one day, and when I was 25, I simply packed my bags and moved here. The bus I took into town stopped right in front of The Witch House, and when I alighted, I smiled, for it seemed a perfect introduction to the “Witch City.” Everything fell into place. Within two days of my arrival, I secured a place to live and four part-time jobs. After five wonderful years in Salem, I regretfully moved away. But five years ago (15 years later), it called me home again. My husband Dan, a museum professional, was looking for a job, and something told me to check the New England Museum Association’s website. When I did, I learned The House of the Seven Gables was hiring. Dan applied for the job, and they immediately flew him up for an interview. Less than a week later, he was hired, and we moved to Salem. We searched high and low for a place to live, in and around Salem. The only place available that we could afford was a condo right across the street from The Witch House. And wouldn’t you know…the first new friend I made once moving back to town happened to be the director of said house. In March of this year, for the first time since my twins were born, I sought a job outside the house. I’d made a little money as an author but needed a real paycheck. Lo and behold, The Witch House needed tour guides. I love history, so the job was a perfect fit. I knew the place had paranormal activity even before I started working there. Nothing negative and not all the time, just someone (or many “ones”) making their presence known from time to time. I’d heard the stories from other employees, and once I spent a little time upstairs in the two bedrooms, I felt a quiet companionship with whomever popped in and out. Then a month ago, things took an intriguing turn. Each bedroom has a fireplace and a bed warmer hanging in front of it. They hang straight and still, no matter what happens around them. A month ago, I saw the bed warmer in the children’s bedroom move by itself in a continuous circular motion. Two days later, the bed warmer in the master chamber followed suit. That second time, I grabbed the handle, stopped it, and walked away, only to turn back around and find it circling again. I checked with the other tour guides, and no one had ever seen that happen. I figured someone just wanted me to know he/she was there. A little over a week ago, my husband and I took our fourteen-year-old boys to the Museum of Fine Arts in Boston. We explored the galleries for hours, reveling in paintings and artifacts and a special exhibit on Winnie the Pooh. Eventually, we grew tired and started to leave, but as we passed a sign for the Lower Ground level exhibits, I stopped short. I had to go down there. I didn’t know why, but the urge was overwhelming. We went downstairs and found 17th-century artifacts, including a room from the period which felt like “home” to all four of us. Then I turned and did a double take. 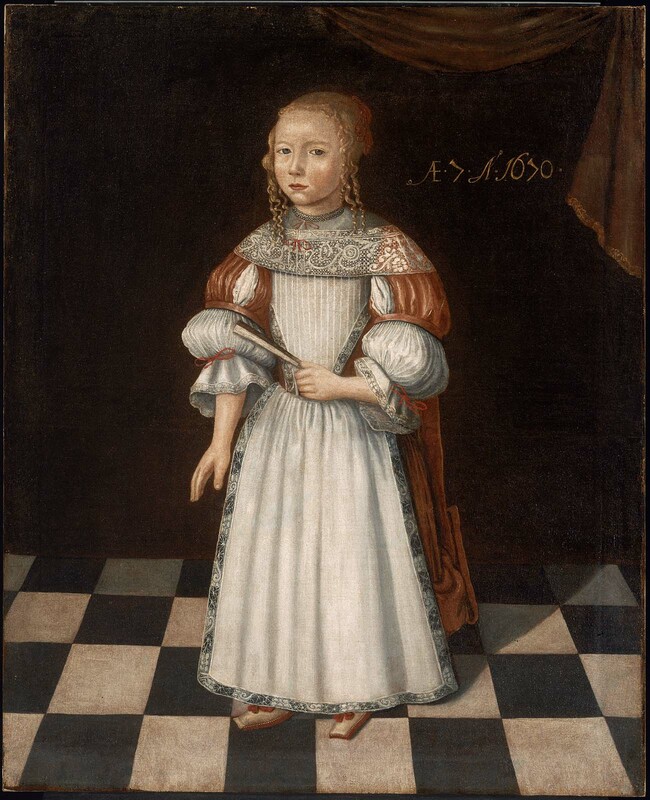 Before me hung two portraits from 1670: one of Robert Gibbs; the other of seven-year-old Margaret Gibbs (shown below). A thrill ran through me, for I see small copies of these portraits every day at The Witch House. (The children’s mother, a wealthy widow named Elizabeth, married Jonathan Corwin in 1675, and they moved into the Essex Street house in Salem. Soon afterward, twelve-year-old Margaret died.) When we went to the MFA that night, I had no idea the portraits were there. I was beyond grateful for the impulse which sent me down the stairs to find them. Fast forward to three nights ago. I dreamt that I was walking through The Witch House. I sensed a young girl of the period (late 17th century) hovering in the corners of the rooms, then drifting beside me. “I love this house,” I said aloud. A rush of love, well-being, and “rightness” washed over me. When I woke, I knew I’d experienced more than a mere dream. Then yesterday, while I was working in The House, a tourist approached and asked if I’d experienced any paranormal activity there. I told her about the circling bed warmers. She revealed she was a psychic medium and had sensed heightened energy in the house. She’d communicated with the spirit of a little girl named Margaret who felt particularly drawn to me. She asked if I wanted to go upstairs so we could make contact together. Of course, I said yes! Slowly but surely, the bed warmer moved. Two things more I confirmed: (1) Margaret had encouraged me to find her portrait in the MFA; (2) she had visited me in my dream. Later in the day, I was back upstairs and felt drawn to the children’s bedroom. When I stepped inside, I knew I wasn’t alone. The bed warmer moved yet again. It was an eventful day! I connected a few dots and felt embraced by history, welcomed by a past inhabitant of the home I adore.